If you plan to use the MySQL Workbench Migration Wizard to migrate databases from PostgreSQL to MySQL you first need to configure an ODBC driver to connect to your PostgreSQL server. 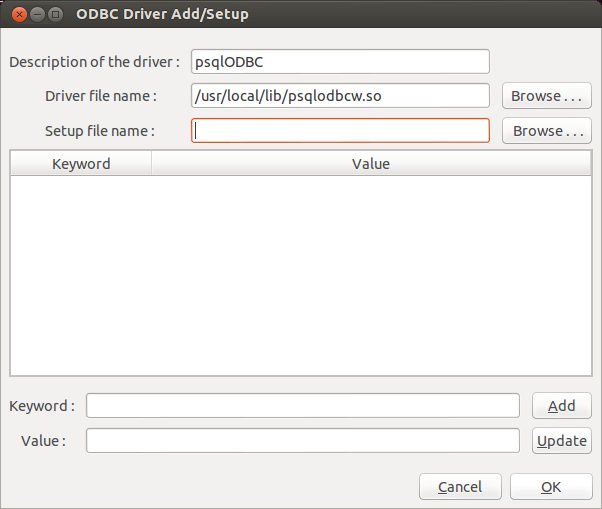 In this post I’ll cover how to set up and configure psqlODBC, the official ODBC driver for PostgreSQL. The procedure is different for every platform so make sure to follow the instructions that correspond to the OS where you have MySQL Workbench installed. The driver needs to be installed in that machine, as explained in the MySQL Workbench documentation. Important: Always install the 32 bit version of the driver, even on x64 systems, as MySQL Workbench is a 32 bits application. Unzip the downloaded file and install the provided MSI package. This is all you have to do. You can skip the rest of this post. 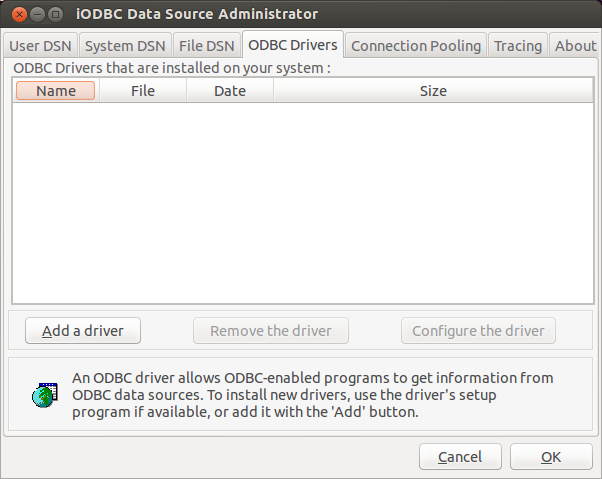 The Migration Wizard uses iODBC as a driver manager for all of its ODBC connections in Linux. This may give you some troubles because most Linux distributions provide ODBC drivers compiled against unixODBC. This is another driver manager not supported by MySQL Workbench so you won’t be able to use those drivers unless you compile them against iODBC. Here’s what you should do. Now we need to install the PostgreSQL ODBC drivers. Download the psqlODBC source tarball from here. Use the latest version available for download. As of this writing the latest version corresponds to the file psqlodbc-09.01.0200.tar.gz. Extract this tarball to a directory in your hard drive and open a terminal and cd into that directory. Verify that you have the file psqlodbcw.so in the /usr/local/lib directory. To build psqlODBC in Mac OS X, you need to have Xcode and the “Command Line Tools” additional component installed, so that the gcc compiler is available. You can get Xcode for free in the AppStore and install the Command Line Tools from Preferences -> Downloads. Open the iODBC Data Source Administrator application either by typing iodbcadm-gtk in the command line or by launching it from the Overview page of the MySQL Workbench Migration Wizard, using the Open ODBC Administrator button. From the main MySQL Workbench screen you can start the Migration Wizard by clicking on the Database Migration launcher in the Workbench Central panel or through Database > Migrate in the main menu. After you click OK you should have the psqlODBC driver registered. I tried this method but standard PostgreSQL ODBC drivers gave me a hard time to configure the connection. It helped me. Easy connection. Please ask questions in our forum or on stackoverflow.com. There is a problem while building. I can confirm that this DOES NOT WORK on macOS Sierra. I’ve lost 5 hours on this, to get it working and it was all for nothing. So this can be done on macOS Sierra. Instead of using the iODBC install as recommended above, I used brew and installed the unixodbc (brew install unixodbc). Once that is done you can run the configure command with the unixodbc flag and the location of you odbc_config file. (./configure –with-unixodbc=/usr/local/Cellar/unixodbc/2.3.5_1/bin/odbc_config -enable-pthreads). When you get this error: “error: invalid variable name” than make sure you replace the dashes for original dashes, because you could accidentally copy/pasted the wrong unicode character for the dashes — like i did. In the end I had a lot of problems with compiling psqlodbc.so myself, while using iODBC to “activate” the compiled driver. To summarize: I got error after error. I eventually gave up using the above described method, as it took me hours, and investigated other possibilities. Eventually i came up with this new method which only took me 15 minutes to get the PostgreSQL driver running. Your comment stopped the insanity that I was going through. Literally: error after error. I was at a point where I was getting tired of googling for solutions to resolve this mess. Thank you Mike for literally saving me from this throbbing headache. Almost started to tear my hair out with this “compile your driver” mumbo-jumbo. They give 3 simple commands as if “it just works!”. Once again, thanks for sharing your solution. Worked great for me (macOS mojave). Made an account on the site just to say thanks. 1. Install PostgreSQL (install just libpq if you want). # These are only necessary if you are running from the Mac UI as a non-admin user (make sure your account is at least in the staff group). Or you can probably just run iODBC Administrator64 from an admin account. 7. Follow instructions above to add psqlODBC driver. If it fails, make sure /Library/ODBC is writable.